Staff Writers for The Times Herald Record. 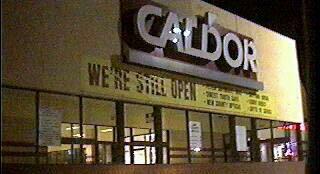 note the sign underneath Caldor - we're still open! Hundreds of Caldor store workers in the mid-Hudson received the news they had been fearing yesterday. The discount retailer, which has operated under bankruptcy court protection since 1995, announced it was closing its 145 stores for good. The $2.5 billion company, with about 20,000 employees, operates stores in nine East Coast and Mid-Atlantic states including Connecticut and New York. Going-out-of-business sales will likely begin in several weeks at all of them to be completed by May, the company said. "I'll have to go and job hunt, but I'll miss the people I work with," said Kori Rogers, 36, the women's department manager at the Newburgh store. 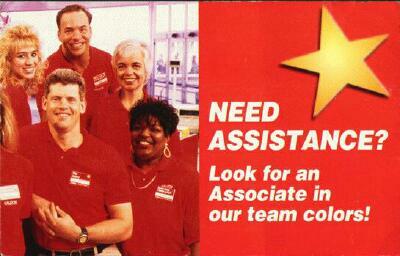 "That's nice, 18 years down the toilet," grumbled longtime employee named Kathy at the Newburgh Mall Caldor. She did not give her last name. Many workers learned about their fate on the news before they heard it from their employer. Corporate headquarters issued a media statement at about noon. At 1:30 p.m., an employee at the Newburgh Caldor had been told by managers not to write rain checks for customers. About a half an hour earlier all the managers in the store were called to the office over the store's loudspeaker. Workers huddled in small groups. It wasn't until 1:45 p.m. when all other employees were called together by store manager Bob Lisiewski. Several left the meetings crying. A frequent Caldor shopper in Middletown took the news hard. "That's sickening. That's a shame," said Martha Frisbie, of Matamoras, Pa., shaking her head. She likes Caldor – especially the prices, especially housewares. She likes it enough to drive all the way to Middletown maybe two or three times a month. The closings will also affect small stores near the Caldor sites. "They were a very good anchor for us," said Neal Greer, manager of the Rockaway Bedding in the Caldor Plaza in Middletown. "Everyone who walks by, walks by us twice." With last year being the store's best ever, he expects to survive Caldor's closing. He expects another discount chain will move into the space in short time. But if months go by with no anchor the independent shops, like Sweet Tooth and 1/2 OFF CARDS in the plaza are likely to suffer most. "We're not franchised. There isn't too many places left for small stores," said Sweet Tooth owner Joe Raffino. 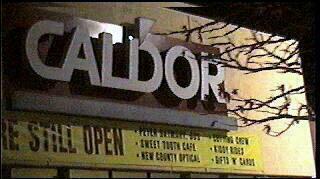 Caldor was founded in 1951 by Carl and Dorothy Bennett, who combined their first names to form "Caldor" and opened one small store in Port Chester. The Bennetts sold Caldor to Associated Dry Goods Corp., and in 1986, ADG merged with the May Department Stores Co. 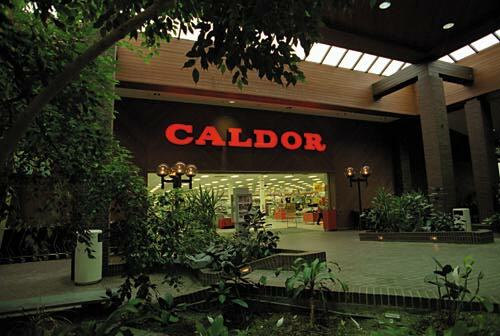 In 1991, Caldor went public and grew into a company with $2.5 billion in annual sales. But in recent years, Caldor failed to distinguish itself from other regional discounters, like Ames Department Stores, and couldn't compete with retail giants like Wal-Mart, Kmart and Target. "Caldor failed to give customers the necessary incentive to choose its stores above those other competitors," said Kurt Barnard, publisher of Barnard's Retail Trends Report in Upper Montclair, N.J. The company was delisted from the New York Stock Exchange last year, and announced Jan. 9 that it was no longer ordering or taking delivery of new stock from its suppliers. There were reports last week that Caldor was in negotiation to sell 64 of its stores to other retailers – possibly Kohl's, Target and Kmart. But no deal was ever announced, and the status of any sale talks was not immediately clear in light of Caldor's decision to liquidate. Caldor will also seek a court order allowing it to sell its real estate assets. The Caldor Corporation and its subsidiaries operate an upscale discount retail chain offering a diverse line of branded and private-label merchandise, including hardline products such as housewares, electronics, furniture and toys and softline products such as apparel, shoes, jewelry, cosmetics and domestics. As of April 15, 1998, the Company operated 145 stores in nine East Coast and Mid-Atlantic states, including the key markets of Connecticut, New York City, Long Island, Westchester County, the Hudson River Valley of New York State, northern New Jersey and the greater Boston, Philadelphia and Baltimore areas. The Company's stores are located primarily in urban/suburban areas with high population densities. On September 18, 1995, the Company filed voluntary petitions (the Filing) for relief under Chapter 11 of the United States Bankruptcy Code. The Company is presently operating its business as a debtor-in-possession subject to the jurisdiction of the United States Bankruptcy Court for the Southern District of New York (the Bankruptcy Court). The Company seeks to position itself as an upscale discount store. To achieve this objective, the Company emphasizes quality and value in branded hardline and softline products, seeks to respond quickly to emerging fashion and product trends and has enhanced its softlines presentation and assortment. 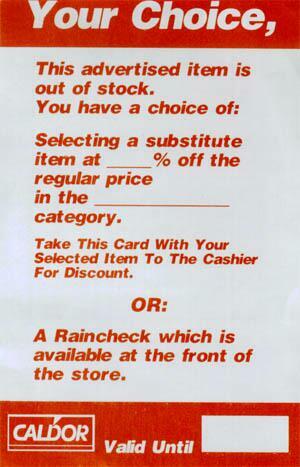 In the third and fourth quarters of 1996, to better balance its promotional and regular-priced business and to provide fair prices, the Company introduced its Price Cut Program, which lowered regular prices on selected items in electronics, health and beauty aids, diapers, household chemicals, furniture, hardware and housewares. In 1997, the Company extended the Price Cut Program to basic apparel commodities, paper products, film and cosmetics. The Company plans to extend the Price Cut Program to other product categories. The Company's stores feature nationally branded hardline and softline merchandise, including KitchenAid, Farberware, Nikko, Westpoint Stevens, Fieldcrest Cannon, SunBeam, Scotts, Fiesta, Rubbermaid, Springs, Sony, Braun, Wrangler, Hanes, Fruit of The Loom and Playtex. Softline sales and hardline sales as a percentage of total sales in 1997 were 39% and 61%, respectively. The Company's softline merchandise balances quality, fashion and price, and its principal apparel lines consist of casual and weekend wear. Although the Company relies primarily on purchases from domestic resources, the Company's direct imports in 1997 totaled approximately 11% of total purchases. Among the Company's discount department store competitors are Bradlees Stores, Inc., Ames Department Stores, Inc., Kmart Corporation and Wal-Mart Stores, Inc. In addition, Target Stores, a discount department store division of Dayton-Hudson Corporation, has recently opened stores in some of Caldor's market areas and plans to expand its presence in the Northeast. The Company's department store competitors include Sears, Roebuck and Co. and J. C. Penney Company, Inc.
Caldor operates a discount retail chain offering a diverse line of branded and private label products such as houseware, electronics, toys, apparel, furniture, jewelry, cosmetics, etc. For the 39 weeks ended 10/31/98, net sales fell 4% to $1.61 billion. Net loss fell 16% to $74.9 million. Revenues reflect the closing of 16 stores since the first quarter of 1997. Lower loss reflects lower general and administrative expenses due to store closings and cost control initiatives.